Punching Nazis, Natasha Lennard contends, is merely the natural edge of a spectrum which also includes controlling our own tendencies toward fascist acts in everyday life. 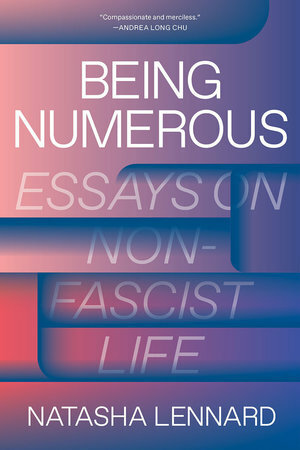 It's fitting that Being Numerous: Essays on Non-Fascist Life takes as its point of departure – and it is a point to which the author, journalist and activist Natasha Lennard, returns repeatedly – the viral video of American neo-nazi Richard Spencer getting punched in the face by an Antifa activist. Lennard is interested in this matter of punching fascists, for which she articulates a refreshingly unapologetic defense. She's critical of what she describes as the innately conservative tendency among some liberals to denounce anti-fascist violence. "We're seeing a liberal aversion to violence, but it is one that fails to locate violence in the right places," she writes in her opening essay "We, Anti-Fascists". The subsequent essays are devoted to revealing the pervasive presence of violence in the lives of poor, racialized, and otherwise marginalized communities. Lennard criticizes the ardent defense of fascists' right to free speech in which some liberals engage, hearkening instead to the direct action approach of the '43 Group of former soldiers who took militant action against resurgent fascists in the UK in the years following the Second World War. The use of violence and aggressive no-platforming effectively contained, if not curtailed, the spread of fascism in that era, she observes. The appeal of fascism does not dwindle under the glare of public scrutiny and analytical logic, she warns. Debating fascists doesn't stop them (somebody please tell Slavoj Zizek, who has taken this notion to the ludicrous extreme of a public debate -- 'The Rumble in the Realm of the Mind' -- with misogynistic right-winger Jordan Peterson). Democracy must be defended through more direct means. There's a lot to talk about here – more than a short essay can adequately cover – but Lennard manages to cover a lot of ground. Importantly, she explores the appeal of fascism, reminding us that even the most fervently self-avowed anti-fascist among us can fall prey to the lures of fascism's desire to dominate. In fact, rather than use such starkly declarative terms as "anti-fascist", she urges us to talk instead about "'fascistic habits' – formed of fascistic desire to dominate, oppress and obliterate the nameable 'other,'"
The potential for such habits, she points out, resides within all of us. She quotes Wilhelm Reich's 1933 study The Mass Psychology of Fascism: one cannot confront fascists properly, Reich writes, "if one does not look for him in oneself; if one does not know the social institutions which hatch him every day." Lennard elaborates these as "everyday fascisms" or "micro-fascisms with and by which we live"; this is why it's dangerously reductive to use labels like 'anti-fascist' to describe an identity. Punching Nazis, then, is merely the natural edge of a spectrum which also includes controlling our own tendencies toward fascist acts in everyday life. "This is the importance of anti-fascism also as practice and habit: if desire for fascism is not something that happens out of reason, then we cannot break it with reason. So our interventions must instead make the entertainment and maintenance of fascist living intolerable. The desire for fascism will not be thus undone: it is by its nature self-destructive. But at least the spaces for it to be nurtured and further normalised will be withdrawn." Rather than embracing an anti-fascist identity, she talks of "anti-fascisting" as a verb – "a constant effort of anti-fascisting against the fascisms that even we ourselves uphold. Working to create nonhierarchical ways of living, working to undo our own privileges and desires for power. The individualized and detached Self, the over-codings of family-unit normativity, the authoritarian tendency of careerism – all of them paranoic sites of micro-fascism in need of anti-fascist care… The strategy is always to create consequences for living a fascist life and seek anti-fascist departures." She returns to the issue of political violence in "Riots for Black Life", touching on a range of protest examples in both the UK and the US. "Liberal commentary on riots," she observes, "especially on those carried out by young, black and poor people, often becomes hypercritical of the choice of targets of damage… I privilege the political force of a riot over the preservation of shop windows. Collective fury, inscribed onto urban terrain in the form of property damage, can be an assertion of presence and power in the face of authorities who would rather these young people remain invisible, silenced, imprisoned or dead." The important thing to remember, she argues, is that talking about such protests as "violent protests" is erroneous because it has "mislocated and thus misframed violence." There was never a state of non-violence to begin with, she emphasizes, and so it is incorrect to blame protesters on initiating violence. "To be clear: any circumstance in which cops take black life with impunity, any context in which it is still necessary to state that Black Lives Matter, is a background state of constant violence. Riotous protesters do not bring violence; the violence was there in the DNA of white supremacy and our world through which it permeates. Protester violence here is counterviolence… When effective police crowd control… gets celebrated as the maintenance of peace, the myth perpetuates that we have a baseline state of peace, peppered with violent turns. Which may ring true for America's white and privileged. But the lie is exposed, over-exposed, glaring: people who have to assert that their lives matter exist in a state of constant violence." Reading the collection, one starts to feel a certain dissonance between two arguments Lennard makes. On the one hand, there's this argument around the defensibility, even the necessity, of violence in order to contest fascism and assert social justice and democratic rights. On the other hand, there's a defense of the right to peaceful protest and a criticism of police who infringe on that right, legally or otherwise (articulated in essays such as "Making Felons", about those arrested while protesting Trump's inauguration, and "Still Standing at Standing Rock"). Yet if there's a defensibility to things like property damage during protest actions aimed at defending democratic rights and stopping fascists, what is the point of arguing non-violent protesters deserve to be treated differently than violent ones? Does not the suggestion of a double standard for protesters who don't engage in property damage undermine the defense of property damage as a sometimes necessary expression of political presence? She addresses this dissonance in the essay "Know Your Rights". There's a strategic necessity to the use of a rights discourse, she says. But she distinguishes between the use of a rights discourse as strategy and its conflation into ideology. "A strategy committed to convincing the state of the rights of 'good protesters' might win some crucial battles in state houses and courts," she writes. "But an ideology committed to the unique protection of 'good protesters' (to be contrasted with 'bad protesters') presumes a status quo in which we do not need to fight." "The use of a rights discourse to defend against repression must be strategic and will always be limited," she argues. "The mistake is to conflate and collapse the defense of liberties with the struggle for social justice (of which the fight for equal rights is only a part." It seems that what she means here is that while contesting fascism should never involve calling on the state to enact more rigorous restrictions on free speech, which would undermine liberties (speech restrictions, even when they exist, are rarely invoked against white supremacists anyway, she notes), neither does that mean that we should go out of our way to defend the rights of fascists to preach hate. There's nothing morally wrong with both defending rights (like free speech), and also struggling for social justice (by confronting fascist and violent or repressive state actors). There's a refreshingly clear conscience to Lennard's writing. She doesn't get lost in the labyrinth of logic that drowns so many liberals; hers is a defense of both rights and social justice, with a very practical view toward how they can be used to complement each other. For those who are wondering whether it's okay to punch Nazis, Lennard offers useful food for thought (and a rounding endorsement). There are some other gems here as well. A very poignant and personal reflection on suicide rounds out the collection, as well as some thoughts on the nature of our social mediated present moment. Her penultimate essay, "Being Numerous", derives hope from the idea that society's embrace of social media reflects not an acquiescent surrender to the inevitability of the surveillance state, but rather a desire to be seen and heard, to "be numerous" – a desire which could yet be directed toward liberatory ends rather than mere corporate profit (as we have thus far seen). And her reflection on ghosts in "Ghost Stories" is downright enchanting (literally so). Against the all-too-common cynicism which denies the plausibility of utopian yearnings she points out that many of us can embrace scientific rationalism yet also believe in ghosts, whether we like it or not. This demonstrates a latent potential within us for believing in one reality while retaining a belief in the possibility of an entirely different reality. "The ghost… is indicative of inexplicable possibilities, which get ruled out as empirically impossible… It's a political imperative to believe (impossibly) that another world is possible, while necessarily being unable to explain that world from the confines of this one." Indeed, she posits the internet as another example of this phenomenon. A mere 40 years ago no one would have believed that any of the things we do on the internet, and the way it has shaped our reality and our society, would ever have been possible. Forty years later, something no one dreamed possible has come into existence and it shapes our lives in ways that our parents and grandparents would never have imagined. Another world, it seems, is possible after all… and if this one is, then surely others are as well. Being Numerous is a rewarding and thoughtful collection of essays, written in refreshingly clear, accessible and often beautiful prose. They're short, mostly comprised of previous pieces of journalism, but provocative and enlightening nonetheless, from an author we may hope to hear more from.